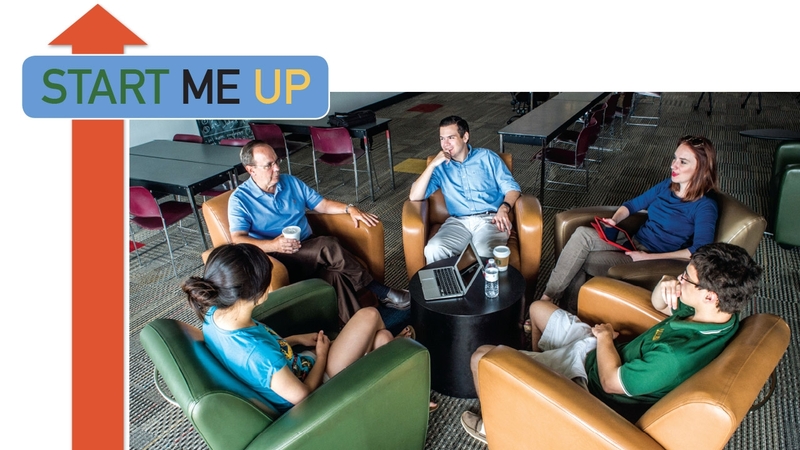 At top: Entrepreneur-in-residence Joel Dobbs (top left) brainstorms with students inside the Innovation Lab. On the popular television show Shark Tank, budding business owners pitch ideas to investors who could make or break their futures. Anxiety runs high. Tough questions must be answered. Dreams could live or die. Now imagine doing that in college. UAB students are willingly facing—and winning—a Shark Tank-style challenge with a tantalizing prize: the opportunity to launch their own start-ups before they graduate. The competition is part of UAB’s strengthened emphasis on teaching entrepreneurship—providing students with knowledge, experience, and inspiration to develop and operate a new company or commercialize a novel invention. In fact, according to the Bureau of Labor Statistics, start-ups less than a year old created 2.5 million jobs in 2010. The Small Business Administration found that small firms—those with 500 workers or less—employed more than half of the private-sector workforce in the United States. While many universities are interested in entrepreneurship programs—eyeing the potential revenue from spin-off companies as state funding declines—UAB, as a major research center, has the infrastructure, enterprise support, and experience to make it happen, says Jack. UAB undergraduate students can earn an entrepreneurship minor, and undergraduate business students can obtain a certificate in entrepreneurship. These students learn the skills needed to open and operate a business, from market analysis and planning to basic accounting. A graduate certificate in technology commercialization also is available. But in addition to their classes, business students can work as interns in the new UAB Innovation Lab (iLab) located inside Innovation Depot, the Birmingham-based small business incubator housing nearly 100 early-stage companies, including some born from UAB breakthroughs. At the lab, students learn by working with the companies, providing paid services such as writing business, sales, and marketing plans and creating software and apps, Dobbs says. Through the experience, students discover how to solve problems and deal with the realities of running a small business, he says. Students learn start-up strategies from Dobbs (right) and early-stage companies at Innovation Depot. Then there’s UAB’s version of Shark Tank: Students can apply to the iLab to launch their own companies, Dobbs says. It’s a challenging process in which applicants undergo interviews and pitch their ideas to a judging panel of local CEOs and attorneys. “We want to get these students to the point where they can get funding through angel investors, venture capital, grants, or business-plan competitions. The goal is to get them funded so they can become a stand-alone tenant in Innovation Depot,” Dobbs says. Six student-owned businesses currently are incubating. These include a service to help nonprofits raise funds; another is developing methods to streamline production of prostheses and orthotics. UAB School of Engineering (SOE) students also are learning to think like entrepreneurs. Directed by Professor Alan Eberhardt, Ph.D., students in the Design and Commercialization Master's Program mix engineering and specific M.B.A. courses, earning both a master’s degree in biomedical engineering and a CSOB graduate certificate in technology commercialization and entrepreneurship. In a separate two-semester senior design class, biomedical engineering students and business students collaborate to build and market devices that solve problems for local clients including the Lakeshore Foundation, United Cerebral Palsy, and the Bell Center for Early Intervention Programs. One successful project from the senior design course was “Toyrota,” a car-shaped wheelchair for toddlers with disabilities. Biomedical engineering students Ryan Densmore, Daniel McFalls, Shelby May, and Stephen Mehi designed the wheelchair so that young children could operate it with a joystick. The group won the international student Da Vinci award, recognizing innovation in assistive and adaptive technology, in 2014. Timothy Wick (center) and Project Lab participants revisit a student-designed device that aids simulation training for health professionals at Children's of Alabama. “It was a big hit,” says Dobbs. “So much so that we’ve had people asking the engineering school to build more.” To respond to those and similar requests, the SOE opened its Project Lab in June. There, undergraduate students will meet the demand for multiple copies of devices and repair the ones in service; they also will adapt past senior design projects for new uses. Once students develop their inventions, they must protect their intellectual property. UAB’s Bill L. Harbert Institute for Innovation and Entrepreneurship (HIIE) is a leader in that area, having translated UAB breakthroughs into more than 55 start-up companies and more than 430 commercialization agreements in its history. Now the HIIE’s five licensing associates are extending its educational reach; they will teach courses about patents and intellectual property and review student inventions to determine if patent applications are warranted, says Kathy Nugent, Ph.D., HIIE director. In the next few years, the CSOB, the HIIE, and the Innovation Lab will share space in a new building on the corner of University Boulevard and 13th Street South. The facility will include rooms dedicated to team and entrepreneurial projects among other teaching and study areas. Nugent says that combining the groups under one roof will foster collaborations across UAB—and inspire students to turn their passion and creative solutions into new economic engines. “It’s about transforming the campus so that an innovative and entrepreneurial culture thrives among our faculty, students, alumni, and community partners,” she says. • Discover entrepreneurship-focused courses and many other academic opportunities offered by the Collat School of Business and UAB School of Engineering. • Take a closer look at the Collat School of Business Innovation Lab. • Give something and change everything for budding entrepreneurs in the Collat School of Business and School of Engineering.